As I said before, I usually try to eat food, but sometimes will eat nonfood edible material. 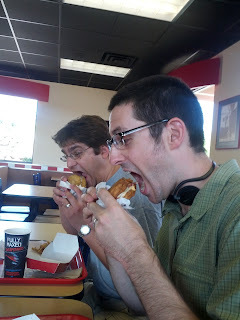 Because our experience with the Doritos Locos Tacos was mostly positive, some friends and I decided to up the ante with a round of Double Down chicken sandwiches from our local KFC. The Double Down is like a regular chicken sandwich, except the buns are made from pieces of fried chicken. I knew that if I could handle this, then I could handle anything. What I learned is that no, I cannot handle anything. We arrived at KFC at 11:45AM and I ordered first: a single DD only, no meal. My group ordered three more DDs, but theirs were all made fresh; mine had been pre-made. The clerk was friendly and the restaurant appeared to be clean, except for the ominously wet ceiling tile dripping into a bucket. We ate with great anticipation, and we were not let down! The Double Down was delicious! I mean, the actual taste, that oh-so-perfect manufactured-in-New Jersey artificial flavor was really quite good. If this story ended with the taste of the sandwich, I would report a wonderful experience. After enjoying the taste of the whole sandwich, I felt very full, and over the afternoon that full feeling never went away. By the end of the workday my stomach had a bit of an ache to it, and then attempting a single after-work chore in some seasonal high heat and humidity left me feeling nauseated. I laid down in bed at seven o'clock last night, skipping dinner, unaware of the upcoming restless and tortured dreams. My stomach churned for the entire night as I failed to fall into deep sleep. Visions of ridiculous bartering occupied my mind as I undulated in and out of sleep. Although I never actually vomited, I probably should have induced myself when I first laid down to bed; I probably would have felt better. Even this morning my stomach ached. I coaxed it back to health with sips of water, a bit of smoothie, a little fruit, then a little more fruit. My stomach didn't feel back to normal until dinner time -- thirty hours after the Double Down! So what caused my misery? None of the other diners experienced any ill effects, but remember that my sandwich wasn't made fresh, as theirs were. Was mine a rancid Double Down? It's possible, but fast-'food' restaurants have rules about how long food sits before being discarded, for exactly this reason. Another clue is that I also got an upset stomach the last time I ate KFC 'food', way back in 2006 in Fairbanks, Alaska. Could it be possible that I have an allergy to one of the famous eleven herbs and spices, or some other ingredient used at KFC? Perhaps, but I don't have any known food allergies, and the other person who ate with me that day also got a stomach ache. Neither of us felt as bad at that time, though, as I did last nite! Maybe KFC is just simply low-quality insane-salt product and my stomach is too sissy for it. And there is some small possibility that my sickness was coincidental and unrelated to the Double Down. My best guess leans toward a rancid sandwich, but I'm not very sure. One thing I can say for certain is that the Double Down was probably my last-ever experience with a KFC: most likely my bad experiences were one of rancid food, an allergy, or simple low-quality food, so there isn't enough of a reason to go back, hoping it was all just coincidence.